You, Me and Movies: Review: Everything is (mostly) still awesome with "The LEGO Movie 2: The Second Part"
Review: Everything is (mostly) still awesome with "The LEGO Movie 2: The Second Part"
We are now four movies into this "LEGO Movie universe" and I have to say that by and large, I have been more impressed by it than I figured I would be. They are wild and over-the-top, at the same time, they have messages that I feel can be appreciated and recognized by older audiences. "The LEGO Movie" was 2014, and not only did children love another fable about doing their best, and knowing that even they are special. The adults got a wake up call on the nasty world of modern nostalgia, and how that can sometimes leave wounds. "The LEGO Batman Movie" not only brought two of my favorite things, LEGO's and Batman, together. But I think it exposed Batman's id in a way that none of the live-action movies have been able to do successfully. I think the most ordinary movie of the bunch is "The LEGO Ninjago Movie" which just seemed like it wanted your cash and that was it. Sequels are tough, they are a necessarily evil in this world and I was curious to see what they would do with this sequel. How they could make this second film special without pandering. Or without repeating themselves. The thing is, it seems "The LEGO Movie 2" is most interested in repeating itself, or just mocking the very way sequels repeat themselves in the first place. This second movie takes place exactly where the first movie left off. 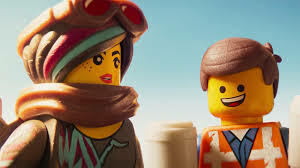 When Finn (Jadon Sand) learns from his father (Will Ferrell) that he has to share his LEGO world with his sister, that leads to a war in Bricksville between Emmett (Chris Pratt) and friends and the weird little kid LEGOs we saw at the first films end. We learn that LEGO world fights these big LEGO's aliens for five years, which turns it into LEGO World: Fury Road. The only person who doesn't seem to mind is, of course Emmett. Even though his world is constantly at war. What eventually springs him into action is the sudden disappearance of all of his friends at the hands of these bizarre aliens. They are captured by Queen Waterva Wanabi (Tiffany Haddish) who assures them that they are not trying to hurt them, even though the behavior is anything but reassuring. In any case, Emmett meets up with Rex Dangervest, who is also voiced by Chris Pratt and is a huge parody of several characters Pratt has played over the years, and some he was just rumored to play. Its shamelessly clever character-building. I'm sure audiences will get a kick out of the humor that rises by the interactions of Emmett and Dangervest. As always, "The LEGO Movie 2" is both wild and over-the-top. If you somehow found "Everything is Awesome" to be the most annoying song in your entire life, well just wait until you hear "Catchy Song" which I think was specifically designed to make people's ears bleed. The whole movie is a massive exaggerated parody on the whole notion of the sequel. Some things are purposefully the same as last time, at least I think they were supposed to be, and that's part of the humor of it all. They do repeat themselves here, but in some clever ways. But the film's secret weapon is how they bend the rules of movies just a little bit to tell a story that is somewhat unexpected. All movie long, I couldn't tell if the movie was going to be predictable or if the movie was going to pretend to be predictable, and that's the fun of it all. The world of LEGO continues to feel like a living, breathing place. Even though its not somewhere I could ever personally go, I love that it always feels lived in. Even when everything goes dystopian, there is a fun way of keeping things imaginative that I felt was rewarding after every passing minute. I do like the sheer look of this world and just how good high definition special effects are in this day and age. The whole notion of making fun of the sequel is clever for a premise. Especially since most of the target audience probably won't even get what is being made fun of, or that there is a joke at play at all. But hey, that's what makes the movie fun for all ages. Some of the humor lands, and some of it doesn't. I think the first film is ultimately a better affair, and lands a lot more laughs. But hey, perhaps that's what makes "The LEGO Movie 2" true in form. This isn't supposed to be better than the first movie, and perhaps they are okay with that. Still, so much is still awesome that its hard to not have a good time.